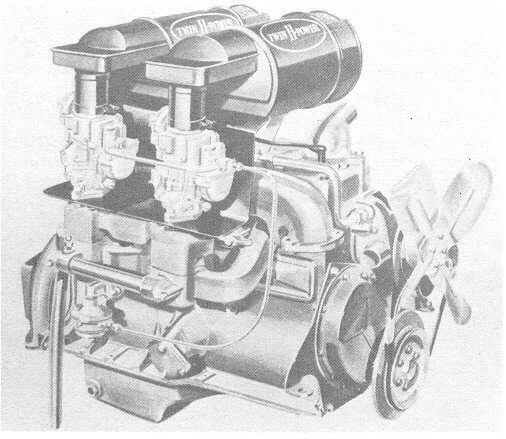 Now you can enjoy the mighty power and matchless roadability of a HUDSON in any price field you choose (including the low price field). The Hudson Company made a number of positive contributions to the design of these early machines. They were among the first to produce closed (as opposed to convertible-type) car models (1911). 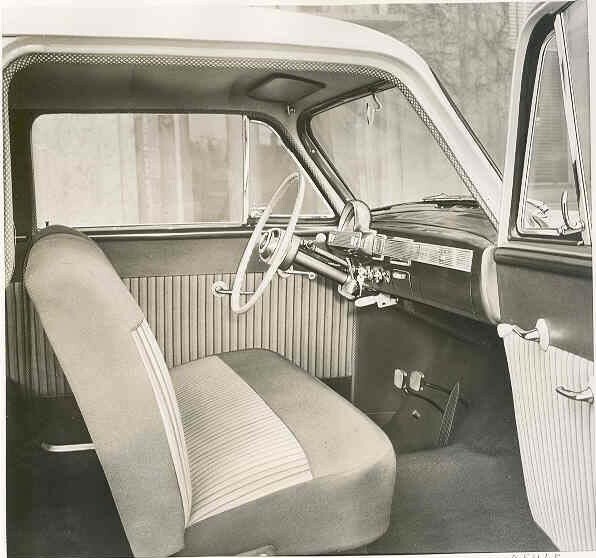 They moved the steering wheel to the left side of the cars; the hand control(s) to the inside and center of each vehicle; and introduced the self starter and dual brake systems to the industry. In 1916 they revolutionized the auto manufacturing world when they introduced the first balanced crankshaft, thus ushering in what automobile historians know as The Age of the Super-Six. And then, in 1932, came their piece-de-resistance; the Essex-Terraplane. It was a powerful hill climber, fast (it set speed records), and it was thrifty. Following a $12 million development program, the economy-priced Hudson Jet debuted in 1953. During development days, rumor had it that Hudson was putting step-down principles into a lighter car. When produced, the Jet's basic suspension and chassis features were similar to the bigger Hudsons of 1946-1957. Suspension is by coil springs at the front and leaf springs at back. Tubular shocks are used all around. Jets have a 105-inch wheelbase. A panel door at the left of the central location of the license plate gives access to the fuel filler cap. The door handles are an independent type, separated from the pushbuttons below them. They featured one-piece glass windows in front and back as opposed to a split window in the larger Hudsons. However, the Jet lacked the low step-down look that the big Hudsons had made famous. Also, for the first time since the early 1930's, Hudson contracted an outside supplier, Murray Corp., to build the bodies. 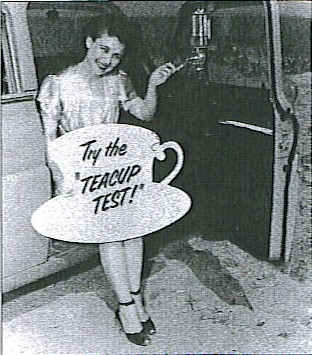 One promotion to introduce the 1953 Jet was known as the "Teacup Test!" In the days when gas was 19 cents a gallon, getting optimum miles per gallon was just as important as it is today. 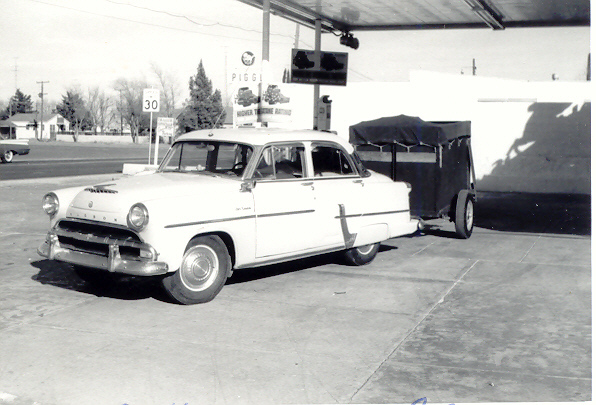 Boasting as much as 24 MPG, Hudson wanted customers to visualize just how economical the new Jet was. Click here to read the details on how this marketing ploy was executed and an article on one couple's experience with the Teacup Test! A NEW KIND OF CAR! and economy you've ever seen!" Prices started at a factory base of $1858 for the standard Jet, when built without extras. This came in a 4-Door Sedan model only. 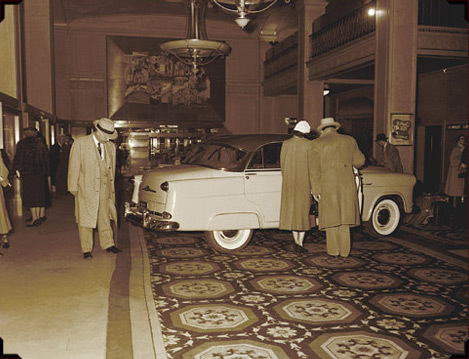 The Super Jet 4-door sedan cost $1954. The 2-door Club Sedan version of the Super Jet cost $1933. 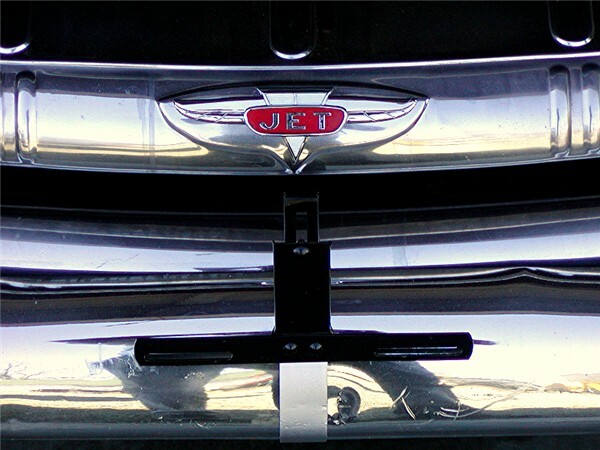 Hood ornamentation, rear fittings, and the absence on the standard Jet of side nameplates, ventpanes in the rear doors, and brightwork around the windows is where the two models of Jet differed. "If you haven't tried the Jet, you don't know what you're missing!" With Twin H-Power (Shown at right.) , Dual-Range Hydramatic and over-drive as options, a Jet sporting Twin H-Power (Dual Carburetion), for example, would have a Twin H-Power nameplate above the centerpiece on the trunk lid. Assessories such as extra window trim, wheel skirts, whitewall tires, and wheel trim rings were also available as well as a 2-tone paint scheme. "When you step on it something happens...instantly!" 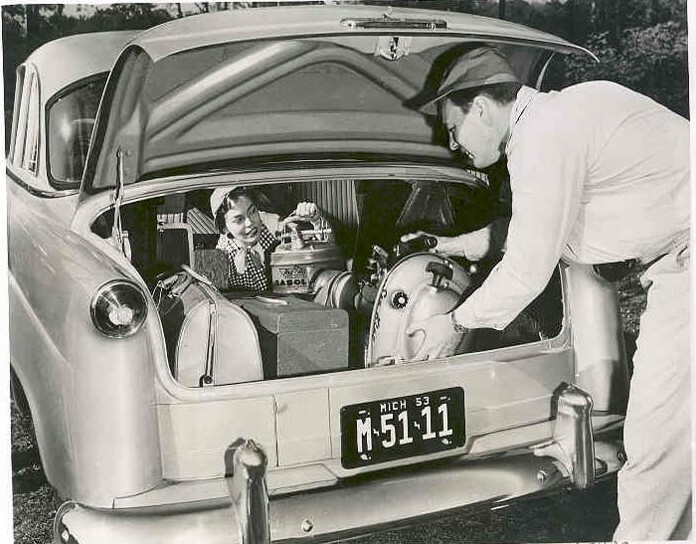 By removing the rear seat and folding the hinged trunk divider partition forward onto the rear seat riser foundation of the 6-passender, 2-Door Hudson Jet Utility Sedan, space was made available from the rear of the trunk to the front seat. This model weighed 2,715 pounds and starting price was $1,837. "RELAX! You're driving a Hudson!" With profound similarity to the 1953, one visual outside defference with the 1954 model was on the grille, where a center medallion was flanked by raised ribs on the main crossmember. The lowest-priced Hudson of 1954 was the Jet Family Club Sedan, first making its apprearance April 12th with a factory price of $1621, $71 above the competing Nash Rambler. The accessories on all models were consistent to those offered the previous year. A minor change between the two years was the front seats being moved back 2" in '54 from where they sat in '53. Hudson... most DURABLE car your money can buy! The top-of-the line Jet-Liner debuted in 1954 in both a four-door and club sedan. This model featured unique body trim and upgraded interiors. A total of 14,224 Series 1D, 2D, and 3D Hudson Jets were built in 1954. Unfortunately, there was not yet a large enough demand for compact cars and sales were not as hoped. Lack of sales were blamed on the side styling as well as high price. The problem with price was somewhat ironic since the compact Jet was an entrant into the low-price field. However, Monobuilt body-and frame construction and heavier gauge steel lead to extra manufacturing cost. Although head room allowed for chair high seats and passengers to wear hats, the vehicle turned out too high compared to the heights of rival cars such as the Nash Rambler and Willys. Yet, the rear wrap window and roof line compared to that of a 1952 Ford, encouraged by Hudson dealer Jim Moran of Chicago. The extra performance of 104 to 114 horsepower produced by a 202-cid six-cylinder engine, sturdiness, and other quality features didn't aid in boosting sales. and there's ample room for six!" For those who are unfamiliar with the terms "Monobuilt" and "step-down," let me introduce you to these features... The Monobuilt design, introduced in 1948, consisted of a chassis and frame that were combined in a unified passenger compartment. This produced a strong, lightweight design with a beneficial lower center of gravity that did not affect road clearance. For the first time, drivers had to step down to get into their cars, thus the name sake of this innovation. By the time the Jet was available, the promotion had increased the dealer network to 1,975. The selling organization also had 11 distributors and 20 sales zones across the nation. 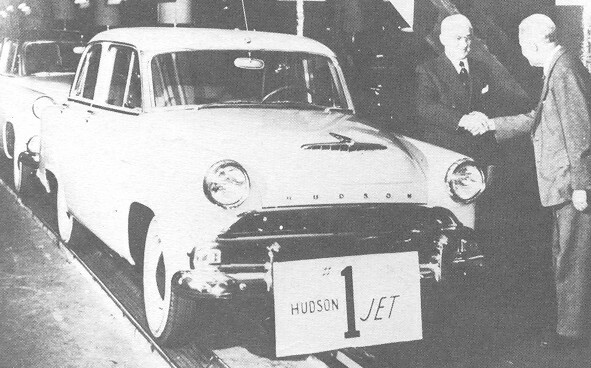 This hype was short-lived as Hudson Motor Car Company's financial debacle continued, losing $6,203,585 between January 1st through April 30th of '54. Nash-Kelvinator and Hudson Motor Car Co. combined on May 1, 1954 to form American Motors Corporation. This merger was viewed as a Nash takeover of Hudson. This perspective was supported by the fact that separate Hudson financial status was never reported by AMC following the merger. It was a short time before Hudson production was moved from Detroit to Kenosha, Wisconsin and Nash-Healey production ceased. The car serial number and the model designation are stamped on a metal plate attached to the right front door body hinge post. The car serial number is also stamped on the top flange of the right frame side rail near the dash panel. See "Hudson Serial Numbers" for more details on 1951 through 1954 data which includes a breakdown of the monthly production of Jet units built. Shipping Weight¹ 2650 Lbs. 2700 Lbs. Sedan: 2675 Lbs. Utility: 2715 Lbs. Sedan: 2725 Lbs. Club: 2710 Lbs. Sedan: 2760 Lbs. Standard Curb Weight² (Sedans Only) Not available. Total: 2850 Lbs. Overall Length (including Bumpers) = 180-11/16"
Turning Radius (Right and Left) = 16' 8-1/2"
Maximum Brake 104 H.P. @ 4000 R.P.M. Maximum Torque 158 Lbs. Ft. @ 1400 R.P.M. Spark Plug Type Champion H10, gap .032"
Shipping Weight is the weight of the vehicle without fluids, but does include spare wheel, tire and tube, and standard equipment. Standard Curb Weight is the Shipping Weight plus the weight of water, gasoline, and oil. Note: Automatic Transmission Weight: 105 Lbs. Hydra-Matic Transmission Weight: 125 Lbs. Starkey Hoot - once worked in the design department of Hudson - Starkey's son, Robbin Hoot, does design, art and clay sculpting. What was going on at the time Jets came out? Hairstyle: Ducktails, tighly curled hair (pin curls), no hairspay but lacquer, hats with bobby pins or hatpins to keep at right angle, and brylcreem. Makeup: Cream foundation in a compact, eyebrow pencils, mascara was a cake you brushed on, and rouge (redder the better). Careers: 20 years on the job has now become 2. Customer service as a soda fountain jerk was a position you took with pride as opposed to the unmotivated fast food employees of today. Clothing: Poodle skirts and saddle shoes is the stereotype most people first bring to mind, but Spaulding, white bucks, blue suede, penny loafers, pedal pushers, stiff crinoline slips, and mini-clothespins on girls clothes were also of fashion. Cars: Fins, whitewall tires, and chrome as well as spotlights and Hot Rods. 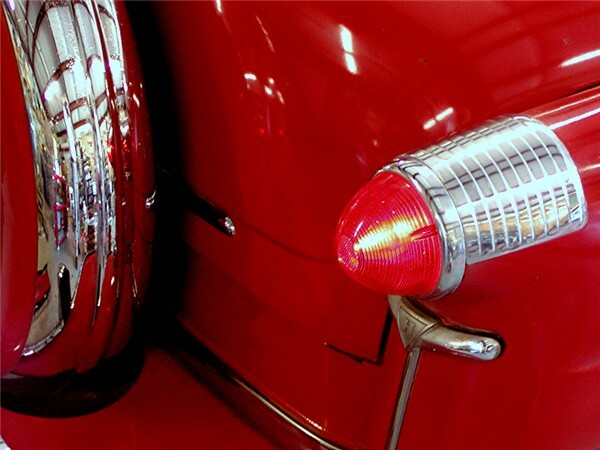 What was then an introduction lapsed into a legacy (�57 chevy, thunderbird). Prosperity not only allowed for new cars, but the addition of a second vehicle. Homes: World War II followed with marriage, houses, and families with values. Interior Decorating was influenced by futuristic shapes. Bomb shelters and pink flamingos (envisioned by Don Featherstone of Union Products) were common. Trailers: Families enjoyed the freedoms of taking vacations and bringing with them the comforts of home. Entertainment/recreation: Drive-in movies (and putting people in trunks of cars to get into the drive-in! ), Record Players, Jukebox, rock � roll, introduction to the television, soda fountain, amusement parks?, roller-skating, roller derby, summer picnics, family night, sock hops, pogo sticks, Mouseketeers, howdy doody time, and tv antennas. In the line at the store, the cashier told the older woman that plastic bags weren't good for the environment. The woman apologized to her and explained, "We didn't have the green thing back in my day." That's right, they didn't have the green thing in her day. Back then, they returned their milk bottles, Coke bottles and beer bottles to the store. The store sent them back to the plant to be washed and sterilized and refilled, using the same bottles over and over. So they really were recycled. But they didn't have the green thing back in her day. In her day, they walked up stairs, because they didn't have an escalator in every store and office building. They walked to the grocery store and didn't climb into a 300-horsepower machine every time they had to go two blocks. But she's right. They didn't have the green thing in her day. Back then, they had one TV, or radio, in the house - not a TV in every room. And the TV had a small screen the size of a pizza dish, not a screen the size of the province of Alberta. In the kitchen, they blended and stirred by hand because they didn't have electric machines to do everything for you. When they packaged a fragile item to send in the mail, they used wadded up newspaper to cushion it, not Styrofoam or plastic bubble wrap. Back then, they didn't fire up an engine and burn gasoline just to cut the lawn. They used a push mower that ran on human power. They exercised by working so they didn't need to go to a health club to run on treadmills that operate on electricity. But she's right, they didn't have the green thing back then. They drank from a fountain when they were thirsty, instead of using a cup or a plastic bottle every time they had a drink of water. They refilled pens with ink, instead of buying a new pen, and they replaced the razor blades in a razor instead of throwing away the whole razor just because the blade got dull. But they didn't have the green thing back then. Back then, people took the streetcar and kids rode their bikes to school or rode the school bus, instead of turning their moms into a 24-hour taxi service. They had one electrical outlet in a room, not an entire bank of sockets to power a dozen appliances. And they didn't need a computerized gadget to receive a signal beamed from satellites 2,000 miles out in space in order to find the nearest pizza joint. But that older lady is right. They didn't have the GREEN thing back in her day! There are skeptics who compare what they feel was the Jets "lack of success" to the tanking of the Edsel. Crunch some numbers and we see how much better the Jet sales were than that of the Edsel in light of what their companys did as a whole.